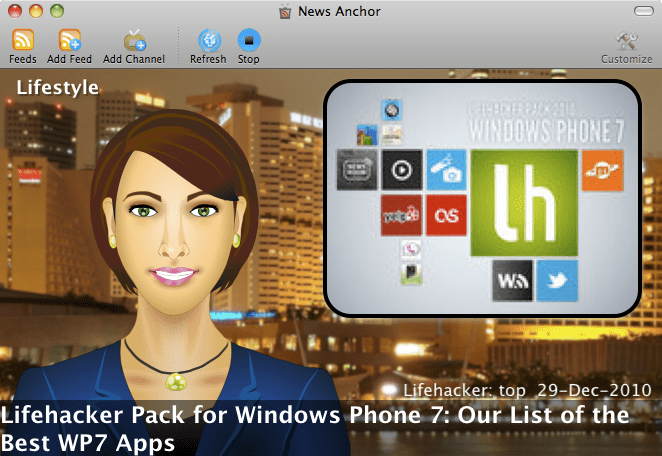 The first month of 2012 is passing by and it’s high time we see what the Mac App Store have in store for us news junkies. Read on for a glimpse of the latest current crop of feed readers for the Mac. The Always On. These RSS readers sit quietly in the background and practically merge with your desktop. You typically use these applications for those brief one minute gaps when you desire some desktop distractions. The Laid Back. These RSS applications are meant for enjoying news while you sit down and relax on your couch or lazy chair. They are designed to be autonomous and require minimum input from you to consume your daily news. The Classics. This category of RSS readers follows the tried-and-true metaphor of an e-mail client, pretty similar to Apple Mail, Microsoft Outlook, or even ye olde Netscape Messenger. 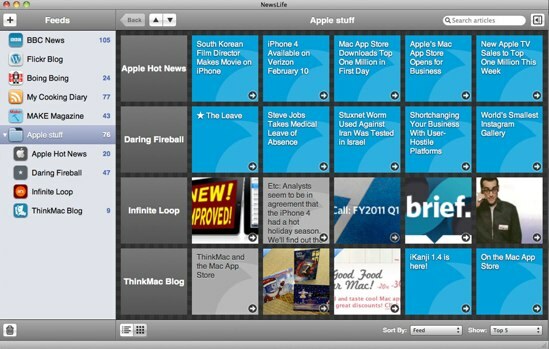 These apps typically has a list of feeds in a left pane and the primary news content will be on the primary pane. Like what the name says, RSS Menu sits in your menu bar unobtrusively. The application adds an RSS icon as a Mac menu extra that you need to click to read your news items. Selecting an item opens your default web browser with the item’s full article. There are some extras like integration with read-later services, Twitter, and some other tidbits but that’s just about it. RSS Menu is a bare-bones no-fuss RSS application. It’s pretty much what you can find in Safari’s RSS toolbar but omnipresent in all application in the right-side of the menu bar. Of course there are other Mac menu extra RSS readers out there, but I find that RSS Menu successfully pack more power without compromising the form factor. Definitely if you’re a fan of menu extra applications, you should check this one out. If your desktop is mostly empty and you don’t run many applications at one time then you could find NewsBar as the feed reader to keep on your Mac. 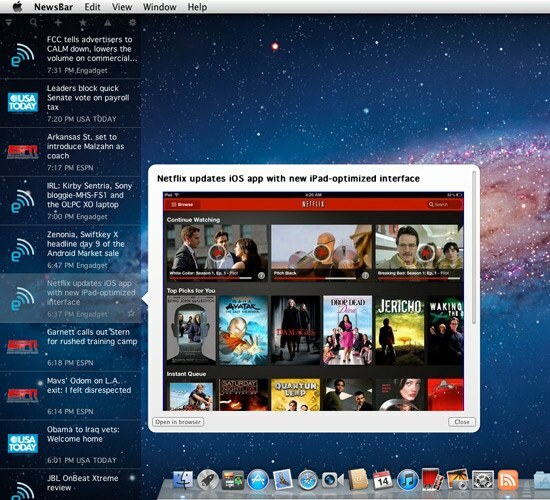 News feeds are streamed on top of your desktop, unobtrusively below all other applications. Seen an interesting news item? Just click on it and the stream freezes to show you that article’s content. NewsBar’s edge over other RSS readers for the Mac will shine when you use it on the 27″ iMac. With a screen that big, why miss out on your beautiful desktop wallpaper to read the news? Fancy of news tickers that you often see on television? Now you can get one for your desktop. 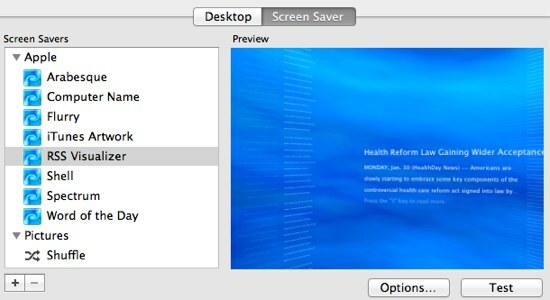 Zipline presents news needs in a scrolling ticker just below your Mac’s menu bar that you can see no matter what application that is currently active – if you don’t maximize it, that is. 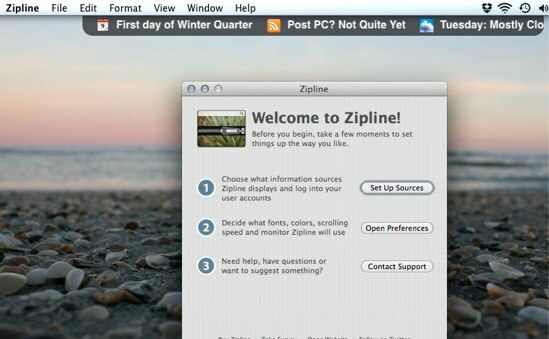 In a sense, Zipline is a lightweight “Zen” version of NewsBar. Since screen savers are actually screen burners and doesn’t save screens, why not have it display something useful instead? The RSS Screen Saver comes built-in with Mac OS X and displays fleeting news items in a beautiful ethereal setting. It uses the same set of RSS feeds that you subscribe to in Safari but limited to only one news feed, which is pretty okay considering that it’s a nice-to-have add-on to the OS. The technically inclined can use Yahoo Pipes to amalgamate multiple feeds together and then finally feed it into this app for news reading during idle times. Get a glimpse of the future when computers finally replace newscasters. Seriously this RSS reader literally reads your news feeds, as in text-to-speech, which is quite far out unlike other RSS readers for Mac OS X. News Anchor has a notion of channels which is a bunch of RSS feeds grouped together and played to you in a single shot just like television news broadcasts. Like television news channels, you can have a Business channel, an Entertainment channel, and pretty much any combination you can dream of. In fact, the application comes with those three channels that you can use as starting points to make your own. Get ready to be dazzled! Spout blasts headlines in a head-turning, eye-popping lively display. Spout is perfect for ambient news displays at parties or other leisure-oriented gatherings. Although you might want to keep this away from anybody who has photosensitive epilepsy as it may trigger seizures. 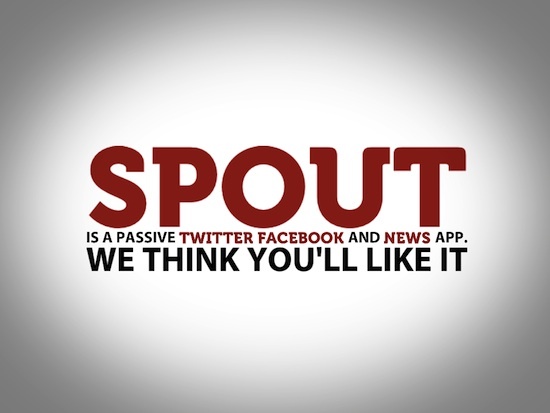 Note that Spout has versions for Mac and iOS and the latter also works both on the iPhone and iPad. 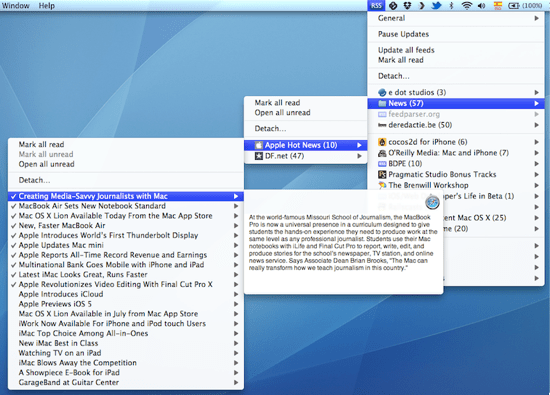 This is the granddaddy of RSS apps for the Mac and still going strong too. 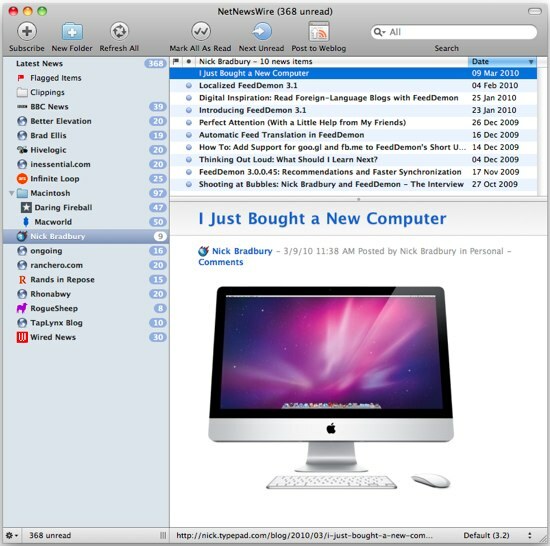 Being a forerunner for desktop RSS readers, NetNewsWire pretty much established the look-end-feel of many other applications in the category. As you can see for yourself, the interface quite resembles Apple Mail or Microsoft Outlook — which themselves look like Netscape Messenger that was popular at the end of the last millennia. Reeder has a collapsible three-pane view approach for displaying your news. When fully expanded, it looks quite similar to Microsoft Outlook. However when fully contracted it becomes more like the Official Twitter Client for the Mac. Reeder’s focus is to be a Google Reader client, which is quite useful if you often find yourself in a low-bandwidth situation such that GReader’s HTML interface becomes too slow for you. Another classic-looking RSS reader, NewsLife differentiates itself by offering an iOS-like interface. In short it’s like an iPad app with an Aqua frame. It also has an overview mode looks to mimic Windows Phone 7’s Metro interface style. With all these options, which one to choose for reading RSS in your Mac? That depends on you, really. If you’re mostly a hands-off person and like to have a dedicated time for reading news, I recommend using an RSS reader in the Laid Back category. On the other hand if you’re really busy when you’re on your computer and have only brief amounts of time to get your news, try the ones in the Always On category. Last but not least, if you’re the fidgety type and like to click around, feed readers in the Classics category will serve you best.